This post is really for my own records. I wanted to list the various series I'd started just to get some idea of which ones I was reading and how far I'd got with each one. Once I began I was absolutely horrified at the sheer number, not only of those where I'd read only one or two, but of the number I plan to read! Hopefully this post will help me keep track of them and maybe inspire me to finish some. I didn't need to start another YA fantasy series, I really didn't. I have more than enough on the go - 18 at the last count - though not all YA. It was just that the first in this particular series, Mortal Engines by Philip Reeve, was on offer for 99p in Waterstones and me not being physically capable of resisting a book bargain, I had to buy it. And it turned out that I liked it a lot and set about reserving the sequel from the library, Predator's Gold... which I probably would not have read as quickly as I did but when I got the thing home I checked online and found that someone else had reserved it and it couldn't be renewed. So rather than lose it, I read it. And I'm glad because, if anything, it's even better than the original. I'm so impressed with this series. The plots are imaginative and pacey but most of all there's very little that's cosy here. The world these people inhabit is dangerous and getting more so by the minute: nowhere is safe. Reeve's writing style has you on the edge of your seat, wondering what on earth will happen next. And his characters are complex... the good guys do bad things or are guilty of bad judgement or of fancying someone they shouldn't. The bad guys have their reasons and sometimes surprise you, and things are not always what they seem, which keeps the reader guessing. It's very refreshing to find this kind of ambiguity in young adult writing - refreshing but very, very pleasing. I wouldn't hesitate to recommend this series to anyone who enjoys YA writing that is not formulaic. Not that I have anything against formulaic, I like it in fact, but there are times when it's good to be taken by surprise and this is one of them. An excellent read. Somehow or other I'm not expecting that this weekend. Anyway, the other reason for me thinking about snow is that the book I'm reading now, Predator's Gold by Philip Reeve, and the book I read before it, Dead Cold by Louise Penny, are both books that have snowy settings. The former is set in the Arctic of the future and the latter in Quebec in winter. 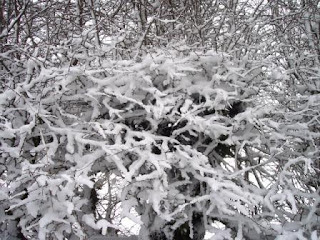 And they made me realise just how much I love reading books with winter-wonderland settings. 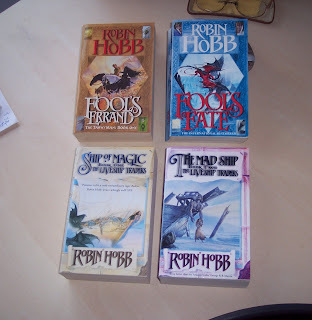 So that, of course, started a book hunt around the house. Does anyone else love doing this or is it just me? Hmm. I don't know why but I would have expected more. So I tried to think of more, but other than the wonderful first chapters of The Wind in the Willows nothing much came to mind. Although one of Ellis Peters's Brother Cadfael books, The Virgin in the Ice, has a very cold winter setting too, if memory serves, and is my favourite of the twenty or so books. I did find a list of sorts here and that does provide a few interesting alternatives but nowhere else could I find a recommended list of 'snowy' books. Not even on Amazon's listmania. So I was wondering... do any of you have any favourite books that have snow settings? Or even just 'wintery' settings - I'm not that fussed - just really in the mood for sitting indoors by the fire and reading about winter. I'm going to be careful about the book challenges I take on next year, only doing those that are flexible and that really suit me. Obviously, I will probably do Carl's challenges as those are a 'must' for me. Other than those though I have two finishing at the end of this year... and then only have one left - the Awards challenge which finishes in June. 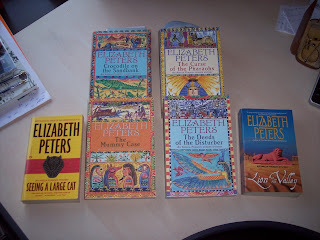 When I read about a new challenge that BooksPlease is doing for 2009 I considered several things; does it suit me? Have I time for it? Is it flexible? Answering 'yes' to all of those questions I really think I must take this one on. Yes... it's a library book challenge! And it's being hosted by J. Kaye's Book Blog. There will be three sizes of challenges. ** The first is to read 12 books from your local library in 2009. ** The second is to read 25 books from your local library in 2009. 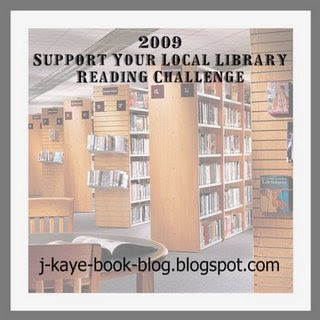 ** The third is to read 50 books from your local library in 2009. You decide which one of the three challenges is best for you. My aim will be to read 25 books. 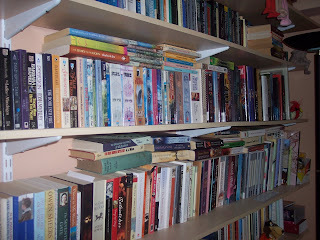 So far this year I've read 18 books from the library so a total of 25 in 2009 should be achievable. Really looking forward to this fun challenge. Two shortish book reviews today. The first is Mortal Engines by Philip Reeve. This YA book was a 'gold' winner in the Nestlé Book Prize, won the Blue Peter book of the year award, and was shortlisted for the Whitbread Children's Book of the Year award. All in all I think that's enough awards for me to include it as a title in the list of my books for the Awards challenge being hosted by 1morechapter.com. Tom, an orphan, is an apprentice to the Guild of Historians in London. But this is no ordinary city of London. This is London centuries after the sixty minute war and this London, like many other cities and towns in the world, travels - on wheels or tracks. And it eats other, smaller towns in order to keep going. One momentous day Tom prevents the murder of his idol, Valentine, head of the Guild of Historians and famous archaeologist. The would-be murderer, a teenager like himself, is Hester Shaw, grossly disfigured in the face and out for vengeance. Instead of being lauded as a hero, circumstances intervene and Tom suddenly finds himself falling down a waste-chute. When he comes to, he is alone with Hester Shaw in the Out-country and London, his home, is disappearing into the distance. Disenchanted as he was with his life, this is not what he wanted. Who is this girl and what is her reason for wanting Valentine dead? And, more importantly, how can he possibly return home? Quite easy to understand why this one won all its awards - it's a cracking tale! I think it's described as YA fantasy but, to my mind, its post-apocalyptic setting is more akin to sci fi not fantasy. Whatever its label, it's an excellent, pacey read. Very imaginative - who would have thought of moving cities? - with good characterisation and many twists and turns. And, like J.K. Rowling, Reeve doesn't hesitate to kill off his characters when necessary... quite shockingly in some instances. Be warned! 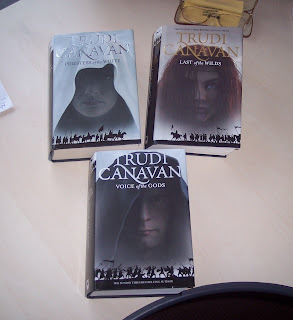 I've just started the second book in the series, Predator's Gold, and there are two more after that. Next up, Dead Cold by Louise Penny, the second book in her CI Armand Gamache crime series. The setting is, as with the first book, the village of Three Pines in Quebec, about an hour and half from Montreal. During a curling match, out on the frozen lake, with the whole village in attendance, CC de Poitiers is murdered - electrocuted to be exact. No one is terribly sorry, her husband, daughter and residents of village all hated her. So the list of suspects is as long as your arm - and who is this woman anyway? Why are there no records of her childhood anywhere? Gamache is pleased to be back in the village of Three Pines and, along with his assistant, Beauvoir, and various officers, one of whose loyalty could be questionable, sets about solving this most complicated of mysteries. Hard to emphasize enough how much I enjoyed this book. It takes place around Christmas, with an extremely snowy setting, so I'm thinking that this atmosphere is probably what appealed to me most about it. It's wonderfully done to the point where you can almost feel the intense cold. That said, the plot is nothing to sniff at either. The twists and turns keep you turning the pages, wondering what will happen next. I changed my mind about whodunnit around six times and up to the end didn't really know for sure. There's also quite a nice background story going on with a conflict between the charismatic Gamache and one of his superiors; I'm assuming that will continue in the next book which is The Cruellest Month, set in Spring. The first two were Autumn and Winter, the fourth book, The Murder Stone, is just out and set in Summer. Great read for crime buffs... and even though I'm not one (although I am starting to rethink that), I absolutely loved it. My lovely friend Deslily at Here, there and everywhere said she hoped I would do this meme - '7 random bookish things about me' - and as I'm always happy to natter about books, here goes. 1. I have this fantasy whereby I go somewhere totally peaceful for a holiday and do nothing but read. My ideal location would be a log cabin by a lake. England isn't exactly famous for such places so I'm thinking it would have to be somewhere in America or Scandinavia. It sounds idyllic, sitting outside the cabin with a lovely view over the lake and mountains just reading and snoozing and cooking something nice on BBQ for meals. Dream on. 2. 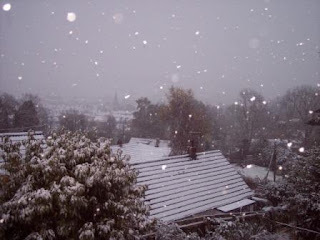 Fantasy number two is being snowed in, in the middle of winter, in a cabin in the mountains, with Harrison Fo... I mean, um, 'loads of books' and nothing to do except read beside a roaring log fire, and make soup. 4. Which leads me to 'why' this addiction. It's a tough one to answer. I think possibly I have this inate curiosity about other people and their lives, the stories they have to tell etc. 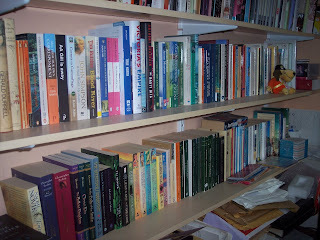 And books, fiction and non-fiction, feed that because that's what they are - people's lives between the covers of a book. I truly believe that all bookworms have this too and that's why we connect so well. We're all naturally curious and have, imo anyway, a special kind of intelligence and an enthusiasm for knowledge. 5. 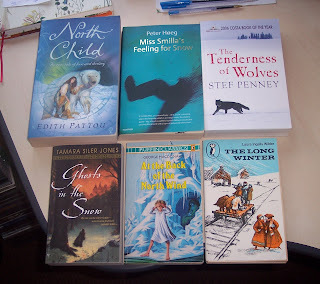 One of the real pleasures of my life these days is discussing books with my eight year old grandaughter. She is now reading some of the YA books that my daughter and her husband read and feel are suitable for her age group. At eight a little care still needs to be taken about content but she gobbled up the Narnia books for instance and adored them. I have a feeling that this little pleasure of mine is only going to increase as she gets older. 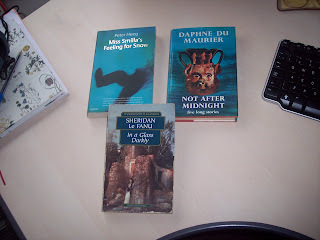 For £3.50 I got a book of ghost stories by Sheridan le Fanu, a crime book I saw reviewed somewhere and have been looking for for a while now - Miss Smilla's Feeling for Snow by Peter Hoeg and, best of all, this lovely hardback book of creepy stories by Daphne du Maurier. I mean... how could I possibly leave that behind??? And because I can I'll do an 8th. bookish thing about me. 8. I really, really, really do not understand people who never read. When I hear people say, 'I've never read a book in my life' I am totally flabbergasted and can't imagine how they ever manage to cope. It's about as wet and miserable as it could possibly be today, 'soup' weather, so I spent the morning making Tara's lentil soup. We had some for lunch and it was absolutely delicious. There's plenty left for another day and it's a definite 'make again' recipe. 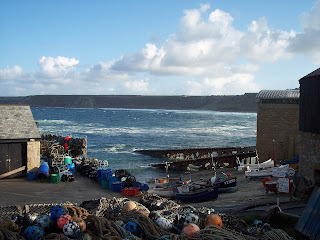 It's 'indoor' weather as well as 'soup' weather so I got going with our Cornish holiday photos from several weeks ago and am posting a few here. 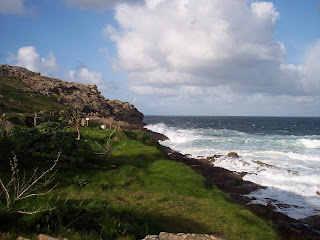 This first lot are of Sennen Cove which is on the same stretch of coast as Land's End, facing the Atlantic Ocean - next stop Newfoundland if you're mad enough to jump in. 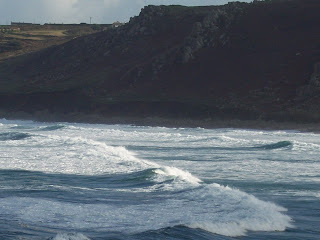 This wasn't a day for jumping in though... we'd had a real Autumn gale the day before and, knowing the area as I do (born and brought up here), I realised that Sennen was the place to go to see some good, rough seas. Two views from the car park. 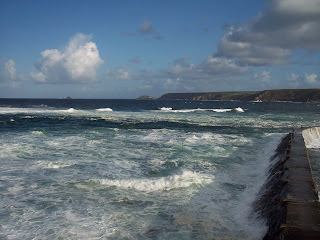 That's Cape Cornwall in the distance in the first one, the only cape in England. Closer photos of that next time. 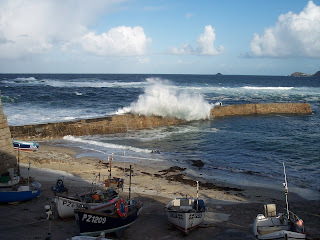 The little harbour at Sennen. 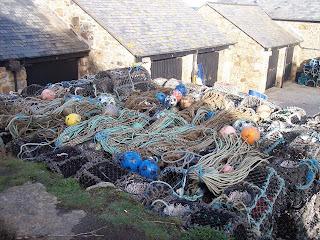 I love all the nets and floats piled up for the winter. 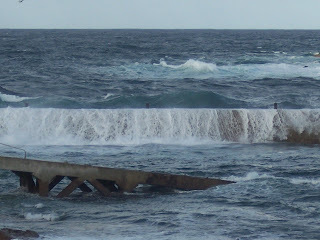 The sea was crashing over this break-water in huge waves and cascading down like a water-fall. 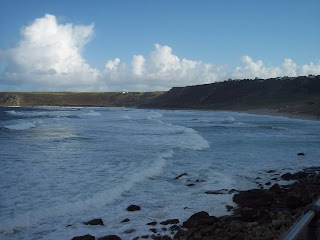 Two of the bay itself... very popular surfing area in the summer. 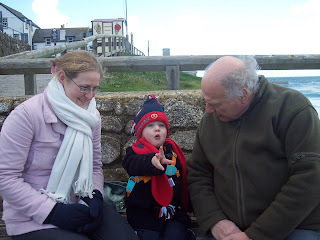 It was quite a cold day - our youngest daughter, our grandson (aged just two) and my husband, all wrapped up against the biting wind. I want a Thomas the Tank Engine hat like my grandson's! Reading-wise I've just finished a YA fantasy, Mortal Engines by Philip Reeve, and liked it so much I'm off to the library to try and get part two this afternoon. More on that book later in the week. Now reading Dead Cold, the second in the CI Armand Gamache books by Louise Penny. One of the things you hear concerning the novel, All Quiet on the Western Front, by Erich Maria Remarque, is that it is the definitive book about WWI and that everyone should read it. I've always felt slightly ashamed that I never have - how can I say that I have an interest in books about that conflict when I've never read All Quiet on the Western Front? Ludicrous. So, this year I was absolutely determined to put that right, despite having pulled out half a dozen other WWI and 2 books that I also wanted to read - this library book was coming first. And it did, and I'm so glad I made the effort at last. In essence this is quite a simple book. It concerns a class of German students, aged around 18, whose over zealous, jingoistic school master practically forces them to sign up to fight in the war. Some are more eager than others but none feel able to refuse. The narrator is Paul Baumer an academic, thoughtful boy from a poor background, and the book follows his and half a dozen of his friends' experiences as they try to stick together throughout the war. "They [the rats] seem to be really hungry. They have had a go at practically everybody's bread. Kropp has wrapped his in tarpaulin and put it under his head, but he can't sleep because they run across his face to try and get at it. Detering tried to outwit them: he fixed a thin wire to the ceiling and hooked the bundle with his bread onto it. During the night he puts on his flashlight and sees the wire swinging backwards and forwards. Riding on his bread is a great fat rat." ...going over the top, how it feels being under fire and the part 'chance' plays in whether they live or die. "It's this awareness of chance that makes us so indifferent. A few months ago I was playing cards in a dugout; after a a bit I got up and went out to go and talk to some men I knew in another dugout. When I got back, there was nothing left of the first one, a direct hit from a heavy shell had flattened it. I went back to the other dugout and got there just in time to help dig the men out. While I was away it had been buried." At one stage Paul is sent home on leave for two weeks. The sense of alienation he feels from his family, friends and various townsfolk, who have no idea what he and thousands of other young men are going through on the front, is intense and heart-breaking. He ponders whether an entire generation, those who survive, will ever be able to live a normal life again. The men who are fighting have become like machines, hardly capable of thinking like human beings anymore. All that matters is staying alive, where the next meal is coming from, and supporting their comrades. There is much more to this book of course: I could go on and on. In my opinion it *is* the definitive book on the Great War. Some might say that it is written by 'the other side', the enemy we were fighting and yes, this is true. But the odd thing is that you forget that when you're reading it. Remarque makes hardly any mention of British, French or American troops, referring to them as 'the others' most of the time and the narrator and his friends just become human beings caught up in terrible events that they have no control over. There was a comment in the paper this weekend to the effect that with most wars people know what they're fighting for and know there's a good reason for being there. But with WWI hardly anyone actually understood why exactly they were risking their lives and certainly this is made very apparent in the book. The futility and waste, the human suffering and appalling conditions are really brought home to the reader. It is the definitive book because in it I can see other books that have been written since where the author has clearly used this work as a reference point. So, do I agree that everyone should read All Quiet on the Western Front? Yes, absolutely. Millions died in this futile conflict, believing it was the war to end all wars. We should never forget their sacrifice. I'm currently reading All Quiet on the Western Front as my WW1 'remembrance' read leading up to the 11th. November - Armistice day. It's brilliant but hard going so for light relief I started Myself When Young, Daphne du Maurier's autobiography of her life as a child (born 1907), teenager and young woman, up to when she married in 1932. I'm not usually one of these people who keeps checking to see how many pages are left till the end of a book because I dread it ending. The end is the end as far as I'm concerned - I don't generally hanker after more. I did in this instance though. When I read in the introduction that Myself When Young was meant to form part of a much longer autobiography that never got written, I felt bereft. I really, really want to know a lot more about this wonderful author's fascinating life. 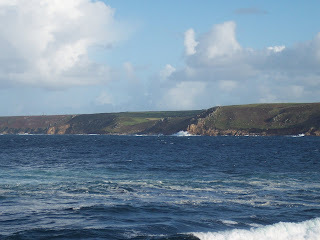 Luckily, there is what I gather to be an excellent biography by Margaret Forster, plus Daphne wrote other books about her family and in particular her father, Gerald, not to mention Vanishing Cornwall and Rebecca Notebook: And Other Memories both of them highly autobiographical I believe. I hope so, I really do. And I recommend this lovely book to anyone who has read and enjoyed any of Daphne's other titles - I can't imagine anyone not being delighted with it to be honest. Well, Carl's RIP challenge is over for another year and it's time to wrap mine up. I enjoyed them all, every single one. 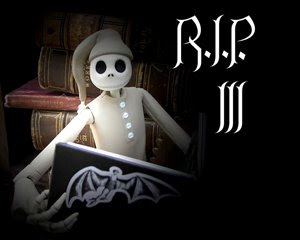 Hard to choose a favourite but if pushed it would probably be between The Ghost stories of M.R. James and Tunnels. But I also loved The Moor and Twilight... Let's face it, I'm likely to love anything that comes under the heading of 'supernatural'!